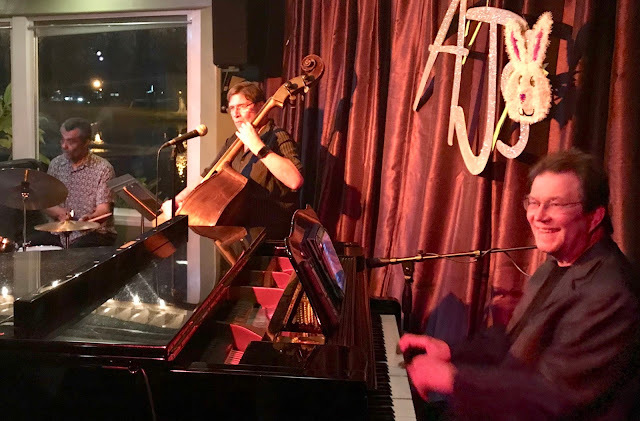 Doug McDonald usually holds musical court at AJ's at the Date Palm Country Club in Cathedral City on Wednesdays but Doug had an out-of-town gig so he brought in Kevin Tokarz to replace him on Piano. I had no experience with Kevin but it only took a few minutes of listening to him to realize he is a super-talented Jazz piano player. Kevin spent many years playing Jazz in Chicago and Reno before moving to the Desert last year. Tonight was a wonderful treat for anyone who loves music played by a Jazz trio. For me, it's hard to top of the pleasure of listening to a Jazz Piano trio especially one playing great standards. Tonight Kevin was joined by the great Bassist, Larry Holloway who never ceases to amaze me with his outstanding Bass playing. I love the way Larry constructs his solos, not just combining a long string of notes within the musical key but rather Larry improvises with thoughtful phrases and always ties in the basic melody of the tune. Tim Pleasant was on Drums tonight and as usual provided stellar support for Kevin and Larry. I don't have any music from Kevin Tokarz at this point but since we are talking about terrific Jazz Piano Trios, I have attached a "YouTube" one of the best Jazz Piano Trios of all times, the great Oscar Peterson Trio playing "The Days of Wine and Roses" with Ray Brown on Bass and Ed Thigpen on drums.